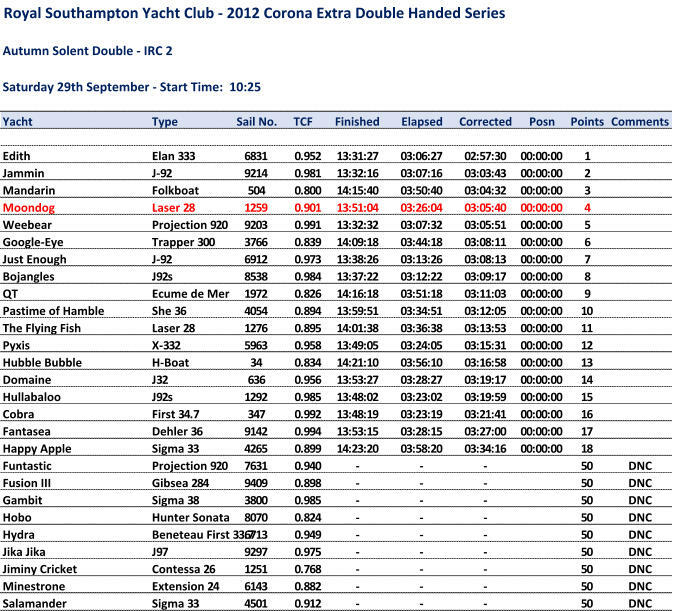 Great conditions for the last race of the RSYC Double Handed series with a decent breeze and sunny conditions. Tight at the committee boat end of the line and Bojangles decided to give us a slap to welcome us back to the series but they did do a 360 shortly after is case we protested them. Good beat to the windward mark, Stormforce Coaching, and then as 5 mile downwind run to Kemps Quay. Seemed to be in quite a good position rounding the mark and didn't let it slip before the second beat back to Flying Fish. Second downwind to Mackley Construction and a shorter beat to the finish at South Coast Sailing. Seemed to be ahead of most of our key rivals but piped for as podium finish by the inevitable folk boat (Mandarin).